Japan: Many modifiers are doing things beyond expectations, especially in terms of performance. Like Kazuhiko Nagata who often produce cars with remarkable performance. Thanks to his cold hands, he was nicknamed Smokey because the car that produced very fast and successful in various races. One of the legendary cars that made it famous is the Toyota Supra V12 engine. 2JZ engine that became innate Supra, replaced with a V12 engine coupled with twin-turbo and nitrous oxide system (NOS). As a result of this one sports car successfully supported by power to reach 930 horsepower. Then to make it look even more sporty, Nagata provide a new bodykit wider about 100 mm. This is done to improve the aerodynamic system when racing fast. So how fast is this car? Nagara had tried it on the highway in England, and the result reached 316 kilometers per hour (kph) when the road was raining. Then he tried again in Italy and the result is better that reach 357 kpj. Interested in having it? 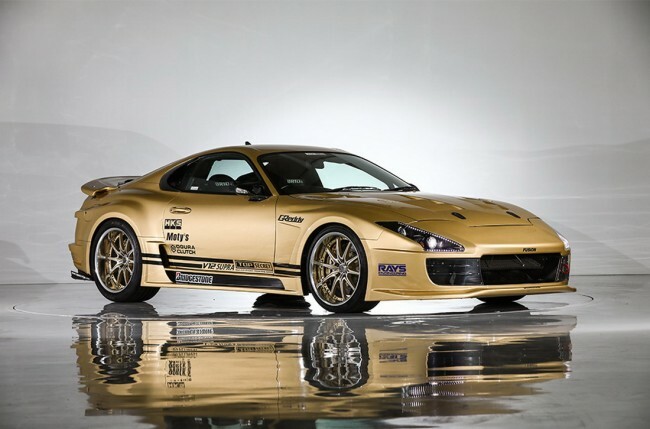 The plan of this gold car will be auctioned on January 12 at the Tokyo Auto Salon. 0 Response to "Toyota Supra Engine V12 This, matching Speed ​​F1"